The LBJ School of Public Affairs at The University of Texas at Austin will pay tribute to the life and legacy of former congresswoman, distinguished public servant and teacher Barbara Jordan during the 21st annual Barbara Jordan National Forum (BJNF), Feb. 19–23. The theme of the signature student-led weeklong event is, Pillars of Change: Perseverance and Resolve, inspired by Barbara Jordan’s words, "It is a privilege to serve people, a privilege that must be earned, and once earned, there is an obligation to do something good with it." 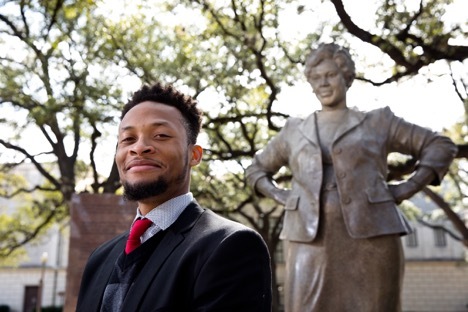 Roosevelt Neely (MPAff '18), who is serving as a BJNF co-chair for the second year, said it is a privilege to lead the student body in honoring Barbara Jordan's legacy. "I believe that there's too much we can learn as students, citizens and aspiring public servants from Barbara Jordan's life not to invest in this tradition of remembrance," he said. 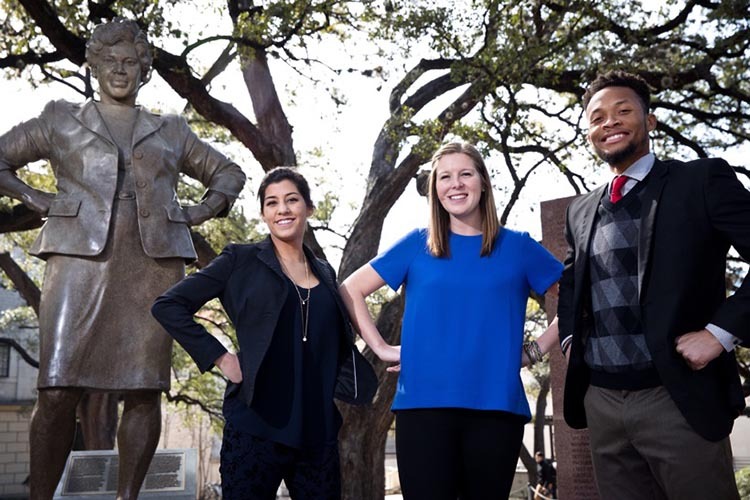 "My obligation to do good means doing my best to execute this week, in cooperation with the co-chair team and LBJ School faculty and staff, to preserve Barbara Jordan's footprint in history and make her life accessible to those who want to learn more today." Throughout her career, Barbara Jordan was a groundbreaker. Her life was marked by "firsts"—the first African-American congresswoman from the South, the first woman elected to the Texas Senate, and the first African-American woman to deliver a keynote at the Democratic National Convention. It is no wonder that BJNF Co-Chair Jackie Chorush (dual degree MGPS/Russian, East European and Eurasian Studies '19) sees Jordan as a symbol of progress. "We do not choose the path of public service because it is an easy one. We choose public service because we share a vision for a better future," Chorush said. "It takes perseverance to continue reaching for a future we sometimes cannot see. I want to bring my appreciation for Barbara Jordan—both as a symbol of progress and as a public servant." 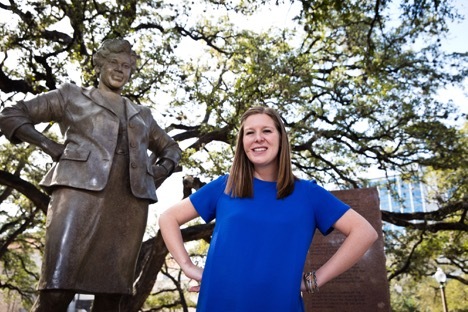 BJNF Co-Chair Hanna Munin (MPAff '19) said she became familiar with Jordan's legacy having grown up in Austin and visiting the Capitol for special occasions with her parents. "It was there at the Capitol where I became familiar with Barbara Jordan because of her portrait in the Senate Chamber," Munin said. "Jordan's perseverance in the face of adversity and commitment to others inspired me to pursue a career in public service." The 21st annual forum includes events from documentary screenings to service projects focused on democracy, equality and social justice issues. LBJ School student organizations lead programming on social justice issues throughout the week. 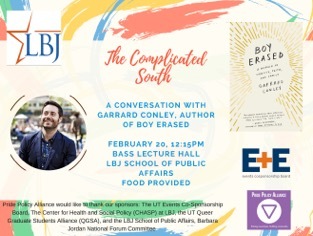 The Pride Policy Alliance, in conjunction with The University of Texas Events Co-Sponsorship Board and the Queer Graduate Students Alliance, will kick off the weeklong tribute with the event, "The Complicated South: A conversation with Garrard Conley." Conley is the author of "Boy Erased" and an advocate against ex-gay conversion therapy. The event will occur on Tuesday, Feb. 20 in Bass Lecture Hall at 12:15 PM CT.
"The African American Athlete: The Renaissance Continues"
In honor of Black History Month and the 2018 Barbara Jordan National Forum, Texas Athletics, the LBJ School, LBJ Presidential Library, UT's Center for Sports Leadership & Innovation and the Division of Diversity and Community Engagement are collaborating to present a special evening event, "The African American Athlete: The Renaissance Continues." The evening will begin with a screening of the documentary, "The Renaissance Period of the African American in Sports," that tells the story of nine pioneering African-American Olympians who shattered records and stereotypes in the 1936 Games in Berlin, paving the way for generations of pioneers. The event, to be held in the Lady Bird Johnson Auditorium at 2315 Red River St., begins at 6:30 p.m. Doors open at 5:30 p.m., and registration is required to attend. Learn more. Ruth Wasem, a clinical professor of public policy practice at the LBJ School and a leading immigration expert, will moderate a panel discussion on the historic US Commission on Immigration Reform, also referred to as the Jordan Commission, which was chaired by Congresswoman Jordan until her death in 1996. 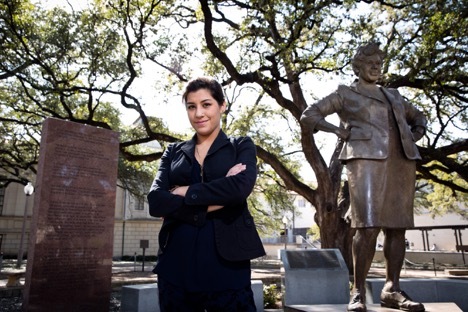 During the event, "E Pluribus Unum: Defending Barbara Jordan's Legacy on Immigration," panelists, Professors Ed Dorn and Victoria DeFrancesco Soto will consider how Rep. Jordan might approach today's immigration debate. On Wednesday evening, the School and LBJ Alumni Board will present three outstanding alumni with the LBJ Distinguished Public Service Award and Rising Leader Award during a special ceremony in the first-floor lobby. Mark Zion (MPAff '80) and Matthew Randazzo (MPAff '03) will deliver remarks. The event begins at 5:30 p.m. CT.
For his extensive achievements and legislative influence throughout his career in the public sector of the electric utility industry. For his significant contributions to education policy, for which he has recently been selected as the next president and CEO of The Dallas Foundation. For her remarkable work during her time as a student at the LBJ School and subsequent work in foreign service through the U.S. State Department. LBJ students cap off their academic experience with a year-long policy research project (PRP), which pairs teams of students with a client to address a complex policy issue in a real-world context. Students on the "Housing, Economic Mobility and Social Mobility" PRP will showcase research findings on the relationship between housing and economic opportunities. The client, HousingWorks, is an affordable housing advocacy organization. Students will discuss Austin's unprecedented growth and the subsequent challenges and policy issues. Sherri Greenberg, clinical professor, Fellow of Max Sherman Chair in State and Local Government and MPAff graduate adviser, leads the PRP. Barbara Jordan Early College Preparatory (BJECP) holds an annual assembly on "Barbara Jordan Day" in honor of the school's namesake and her legacy. LBJ students volunteer during the assembly and in the classrooms, often reading to students.